livin vintage: Does Anyone Remember This....? This past weekend I was reminded of one of my most favorite things to read, Reminisce Magazine. I was at this amazing digger sale and came across two old issues and just knew I had to get them. 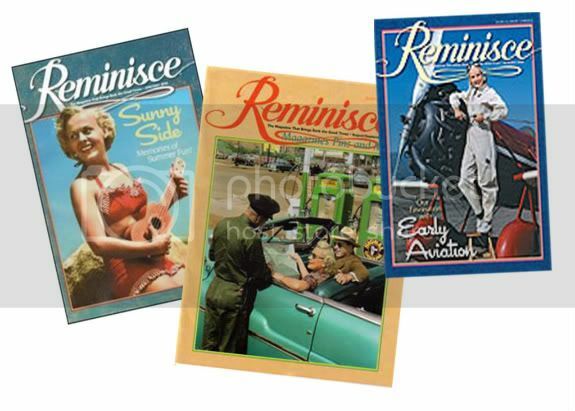 When I was a little girl, my grandma had a subscription to Reminisce and I can remember sneaking copies home with me to read all the lovely stories from the olden days. I haven't seen this magazine for sale in stores for years and was delighted to find out that it is still in print and you are able to get a 1,2, or 3 year subscription. So, my question is, do any of you vintage gals remember this magazine? Can you still buy it at your local book store? If you haven't heard of this magazine or haven't read it in a long time, no fears, I am planning on giving away a one year subscription in my up coming giveaway, which is totally overdue!! I LOOOVE this magazine! I got a continuing subscription for my dad and I also pick up copies at thrift stores and g-sales whenever I see them. I've never seen it in stores, only through subscriptions. The stories really warm your heart! I have one issue I found at a used book store and I keep meaning to get a subscription! I used to work for a retirement home and we got this magazine all the time to read aloud to the clients. I loved looking at all of the pictures and reading the stories. I wish I would have known that you like them, I was at a dig sale this weekend and they had a whopping big box of them! I love it! My grandpa has gotten it for a few years so I always read back issues when I'm visiting his house. My dad discovered it there too, and now he has a subscription as well! And we just decided to get a sub for my Father in law for Christmas. He's SO hard to buy for and not really a reader but I think he'll really get a kick out of this mag since the stories are short and there are lots of great old photos. I've never seen it in stores, but then I haven't looked. I'll have to keep my eye out when I'm thrifting! My girlfriend has a subscription and she always gives me hers when she is done. I LOVE it too, and I save every issue. Hey I just wanted to let you know I posted a Shabby Apple dress giveaway on my blog! Also I need to check out this magazine, looks nifty. thanks for the tip on this magazine. you're so in the know emily. i learn quite a bit on your blog. I've never heard of it - looks cute though! Our little library has a subscription to this, I love browsing it! My mom and dad used to have a subscription for this and I loved it! When they would get through reading it, they would give it to me. I may have to get my own subscription. Wow I didn't know it's been around that long! I've been getting it for about 10 years now by subscription.